The Canadian Steamship Lines sister ships Noronic, Huronic, and Hamonic, originally built for the Northern Navigation Company, steamed along the course shown in the company’s promotional poster, above right. When Northern Navigation and Richelieu & Ontario Line merged to form the Canadian Steamship Lines, the sisters became the new company’s Northern Navigation Division. Named for Lake Huron and the oldest of the sisters, the Huronic’s maiden voyage took place in May 1902. On November 21 of that same year, she passed the steamer Bannockburn—now known as the “Flying Dutchman of the Lakes”—which sank that night. During the Great Lakes Storm of 1913, also called the “White Hurricane” for its hurricane-force winds, which blew from November 7–10, she ran aground on Whitefish Point, Michigan. 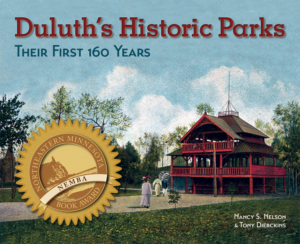 In 1928 she beached on Lucille Island, southeast of Lake Superior’s Pigeon Point. Late in the 1930s, her cabins were removed from the upper deck, and passenger service ended. She was scrapped in Hamilton, Ontario in 1950. The Hamonic, named for Northern Navigation president H. C. Hammond, first launched in 1908. Considered the most beautiful passenger and freight ship to ever run the Great Lakes, her dining room had a vaulted ceiling and featured a mural of natives and French explorers meeting at the shores of a lake. She came to a fiery end in the early morning hours of July 17, 1945, at Point Edward, Ontario, in a blaze originating at a warehouse along the pier. All four hundred aboard the Hamonic lived to tell tales of daring rescue, including the efforts of a coal crane operator who lifted fifty passengers from the bow of the burning ship to the shore. Others jumped into the water—including the last man off the ship, Chief Engineer James Nielson—and were plucked from the water by the Hamonic’s captain, Horace Beaton, who had commandeered a small boat. A total loss, the Hamonic was scrapped in Hamilton, Ontario. 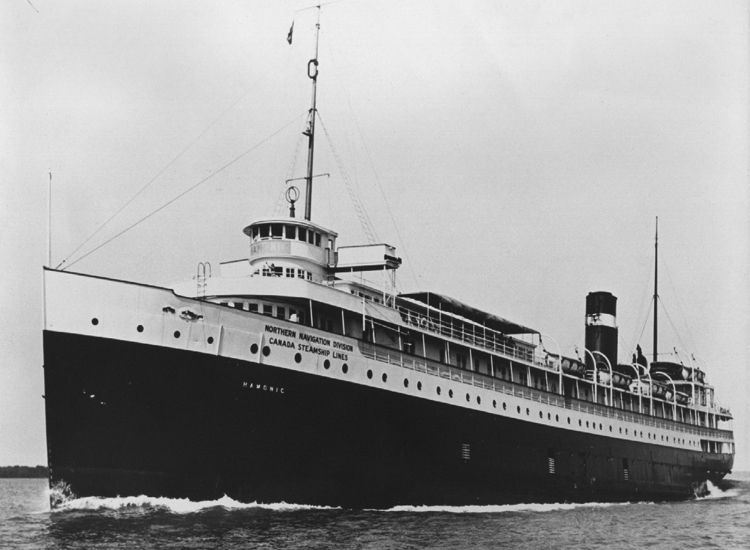 From 1914 to 1949 the Noronic ran from Detroit and Windsor, Ontario, to the “Lakehead”—the Twin Ports of Duluth and Superior. Like the Hamonic before her, the Noronic’s fate would be sealed by an early-morning fire. While the ship was docked in Toronto in September 1949 during a post-season cruise, a passenger awoke at 2:30 a.m. and smelled smoke. A locked linen closet was burning; when it was unlocked, it exploded. Half of the Noronic’s decks were on fire by the time anyone could sound an alarm. By 4:41, when firefighters first arrived, the entire ship was ablaze. Many passengers were trapped; those who weren’t jumped into the bay. Newspapers reported that the screams of the dying were heard over the inferno’s roar and the wail of whistles and sirens. The ship sunk; 139 people died, some still in their beds. The Noronic’s salvaged hull was later sold for scrap.